This homemade body lotion recipe is primarily a hand cream, but with a little imagination and a few simple tweaks, it can be used for most all things. When I first started making soap, people asked me about natural skin care. I tried a few recipes and some of them worked, but some of them–well–not so much. I came across a hand cream recipe that looked good, though when I tried to make it, it came out greasy and often separated. Of course, the original recipe had me using paraffin wax and mineral oil. I knew there had to be a better way. I changed the oil in the original recipe to olive oil, but that was a bit too oily. I tried coconut oil, but some people have allergies to coconut. So finally, I made up a combination of grapeseed oil, sunflower and safflower oil. Grapeseed contains a great deal of antioxidants (read about antioxidants here) and sunflower and safflower have vitamins and minerals. Vitamin E is available in the highest quantity in these oils. You could also use sweet almond oil, hazelnut or macadamia nut. All of these have different properties but are similar. You can use an infused oil (see how to infuse oil here) such as calendula. This is one of my favorites. You’ll also need wax. I’ve used soy wax and beeswax, though any wax should work. You may have to tweak the recipe since all waxes are different – some harder, some softer. Try the recipe (below) and then decide if you need more or less of the wax you’re using. It’s worth mentioning that beeswax can vary by time of the year and different flowers the bees are working with, so you’ll need to be aware of that too. You can use just about any type of water. I like rain water, though well water or distilled would work too. You can use infused water, like a tea, to get the compounds out of a plant you might be working with. I have used chamomile tea, aloe water (aloe leaves boiled in water, then strained), mint tea and even coffee. The last ingredient you’ll need is borax, which is a type of salt. It acts as an emulsifier and natural preservative. If you purchase a large box at your local grocery store it is cheap and can be used for other things like homemade laundry detergent and homemade dishwasher detergent. Items that you can add in small amounts are butters, like mango butter, shea butter or cocoa butter. For this homemade body lotion recipe I’d add no more than a teaspoon and melt it with your oils. You could also add hemp seed oil or Vitamin E from a capsule. Just stick a hole in a capsule and squeeze it out. Essential oils are great for adding scent and healing properties. Try lavender or tea tree. These should be used in very small amounts, like 10 drops or less. Let your nose be your guide. You could also use a powdered pigment as a coloring agent, but it would have to be very small amounts, like 1/16th of a teaspoon (yes, really!) and it needs to be mixed in oil to get all the lumps out. I don’t bother with color – my cream speaks for itself. Remember, you may need to adjust this recipe a bit depending on your oil and wax. Place your oils and wax in a heat proof container. I use a glass measuring cup that can handle high heat. Microwave on high for a minute, then check. You’ll probably need 3 minutes. Alternatively, you can place a stainless steel bowl over a pot of boiling water for a makeshift double boiler, melting your oils and waxes in it. Either way, the mixture needs to get very hot, almost to boiling. If any wax remains unmelted, you can stir it and it will melt. Add any butters, like shea butter, to the hot oil and continue to melt. In another container, heat the water to boiling. Add the borax and stir. This mixture needs to be kept very hot as well. Use a towel or oven mitt when handling. When you have both mixtures hot and melted, slowly pour a small amount of the water into the oil. Be careful as this can bubble and come to the top. Keep stirring in the water until it’s all incorporated. It should turn to a creamy consistency. If it doesn’t, or if it separates, don’t panic. It just means that one or the other wasn’t hot enough. Keep stirring for a few minutes and then use my soap making trick – an immersion blender. It’s the only way to get it creamy if it separates or is too cool. Blend for about 5 minutes, possibly less. You’ll notice it begin to thicken up and turn creamy. If you don’t have an immersion blender, you can use a whisk or a hand blender, but be aware that they could add extra air. When it’s blended and creamy, add a few drops of your essential oil. Stir and sniff. Add more if desired. I use about 10 drops for this size batch. When the desired consistency and scent is achieved, transfer to clean containers. I’ve been using small repurposed baby food jars. They are a nice size to dip your fingers into and the tops can be painted so they look nice. You can also find small glass containers perfect for creams here. This is primarily a homemade body lotion, but with a little imagination, it can be used for other things. Add aloe water and lavender essential oil for an after sun cream. Use arnica infused oil for a bruise cream. (Note: Don’t use arnica on open wounds or internally, as it can be poisonous if used in this way!) Add ginger, turmeric and hot pepper for an arthritis cream. Use mint tea and rosemary essential oil for a foot cream. Add tea tree and lavender essential oil for a cut and scrape cream. And my favorite, add cocoa powder and cocoa butter for a chocolate scented hand cream! While this is too heavy for a facial cream, it can be used on most all other parts of your body. Like this recipe? Try our other homemade lotion recipe. 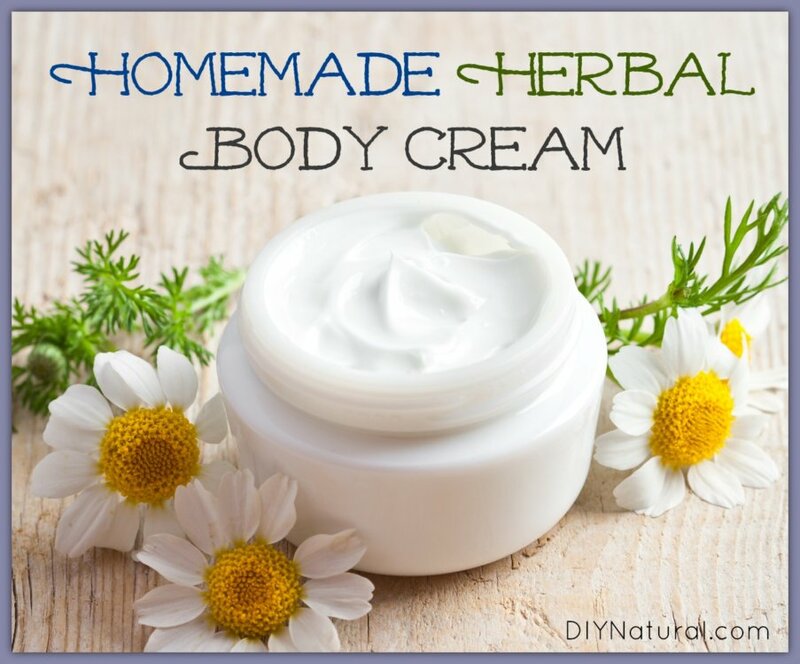 Have you made homemade body lotion before? How did it turn out? Thanks Susana! I’ve never used cinnamon or cacao ground before, but I love them together. I’ll have to try it. Great antibacterial benefits and antioxidants too. What temperature is best for oil and water phase? One source said 80C for water, 70C for oil. The mixture was very hot and the waters kept separating after I stopped blending in a glass blender. I poured super slow, into the vortex as required 🙂 Then I transferred the batch into a stainless bowl to cool a bit and blended with a electric hand blender (not whisk) at high speed. It emulsified, BUT after packaging the product ‘sweats’ a bit, more when it gets agitated or ‘remixed’. Anyway, I DID NOT use borax and all my hopes are in it at the moment…just ordered some. I wish recipes would actually NOT leave any room for changes and creams would come out close to store bought. Thanks! Hi Laura, When I make this cream, I make sure everything is really hot. I’ve never taken the temperature, but I’d guess they were close to boiling (212F) because the water bubbled. I’ve also never used a blender, just an immersion blender. I don’t think a regular blender can get up to the same speed, so that might be an issue. And I have tried it without borax and it separated almost every time. I have substituted baking soda as the composition is similar to borax and it seems to work. Hi Supriya! I just got some emulsifying wax and will be trying it soon. I’ve never heated everything together at the same time, but I’ll be trying that too. Thanks! I have made natural lotion with grapeseed oil (I chose it because it was rated as one of the most absorbent lotions.) , water and beeswax from your recipe about a year ago. I really like making my own lotion but I find that it makes an oily stain on my garments. I see the addition of borax to the recipe now. Will this make the lotion less greasy or do you have another suggestion? A friend bought me some natural shea butter lotion and it is not greasy. I would welcome any comments. Thank you. Yep, this is my issue – and why I’m asking about a lighter / fluffier / more easily absorbed creme. And I would also like to know: what ratio of glycerin did the other poster use as humectant? Hi Roxie! When I first made this recipe it was very greasy. Now, with the addition of extra wax, it’s great. You can’t even see the grease when you first put it on. Use a small amount at first. A little goes a long way! Thank you ladies for your suggestions. I will try them. I make lotion very similar to this. However I found that I was always dry feeling. At first I thought I might be allergic to something, so I tried changing things up, did tons of research and what I came up with is that there is no humectant. So I started adding vegetable glycerin to the water portion. And bingo that cured my problem. Thanks Renee! I’ve never tried glycerin with mine, but I will with the next batch. I don’t know why I didn’t think of it before! I can not believe you would suggest to use the microwave for melting that is horrible the waves from the microwave are very bad. Debra gave an alternate method of heating for those who don’t like to use microwaves. We offer alternatives and trust our readers ability to make these decisions for themselves. I have been making body and facial creams for years, with a somewhat different process. I always use distilled water or flower waters (flower waters are distilled) because they don’t contain anything for bacteria to feast on and turn the product bad sooner. Also, beeswax, or other waxes, are emulsifiers. What emulsifies the cream–blends and holds too unmixable substances together so they won’t separate–is the wax, as well as the borax, and the mixing itself. I also don’t worry about getting too much air in the product, I figure it will just have a lighter feel. With some experimenting, you can also use different proportions of water to oil to make different consistencies. Just keep track of your proportions and amounts. Thanks Iris! I’m hoping to make some floral waters this year when I finally get my still built. Floral waters are a by product of making essential oils and a fun one at that. Cath, coconut oil is supposed to reduce scarring. Hey Cath, in herb school we were taught to use vitamin E and lavender oil. Vitamin E reduces scarring, even older scars and lavender essential oil encourages new skin cell growth. Hope this helps! Try Tamanu Oil, it’s a great healing/scar reducing oil. Would this recipe work for a 8 months old baby? Sure would, Jahel! I’ve used it on my friend’s babies many times. You could add some lavender essential oil for a calming effect and it will help with diaper rash. Or you could use calendula infused oil as the oil part. This with a bit of lavender has been an all around favorite. because of her age, just what you’re doing already may avoid scarring. I would add some vit e and also the highest quality essential oils you can find. helichrysum, lavender, lemongrass, patchouli, sandalwood and myrrh are all used highly in wrinkle & scar recipe. Any e. oils you find that are high in monoterpenes, which mend and repair the damage to your cells are a good choice. I would also gently massage the scar (using mainly pressing & gentle pinching) it keeps blood & oxygen flowing in the area, which makes it heal faster and also keep scar tissue from forming. I’ve been making cocoa butter-based lotions for the past year or so, using your recipes as a base. My friends all love it when I do that, because I always share with them! But I would really like to make a soft, creamy non-greasy facial moisturized. I search your site and the web but have not come across a recipe. Can you help? I found one I really like in the health food store, and the ingredients included “emulsifying wax” so I emailed the woman who makes it to see what she uses. It’s a palm oil, called “Polowax.” I’ve not heard of it but will see if I can find it. I live in Mexico, so my local supplies are limited. Lydia-Jane, you can try grapeseed oil which is light and doesn’t clog pores. Also, beeswax works just fine for emulsifying facial creams and also doesn’t clog pores. Or try carnauba wax or candelilla wax, both plant-based. I haven’t worked with them, so I am not sure what they are like. I hope this helps. Grapeseed oil is a great choice, Iris. Thanks for the tip. I haven’t tried the other waxes either, but I have used soy wax, which you can get online. It does seem greasy at first, but after it soaks in, just a few minutes, there’s no trace of oil left. Which essential oils would you suggest to get that wonderful tropical, ocean-type fragrance that is in the salt scrubs I’ve seen in Florida. I make my own scrub using white sugar, brown sugar, coconut oil, grapeseed oil, teatree oil and Vit E. But I’d really like to arrive at that “island” fragrance. Thanks for any suggestion you might be able to offer. Just thinking…you already have the coconut scent from the c. oil…..what about adding lime eo or grated lime zest & a touch of vanilla ????? Great ideas Joy! To that I’d add ylang ylang and tangerine essential oils. They have a nice tropical air to them. Neroli and bergamot may help too. I’ll have to try a few combinations and let you know what works best.